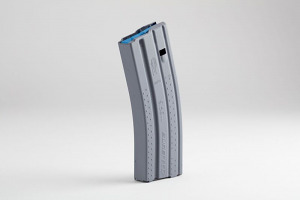 OKAY Industries Surefeed 30RD AR15 Magazine - Grey DFL - E2. This Okay Industries Surefeed magazine is designed for use with 5.56 mm/ .223 caliber ammunition and will fit/function in AR-15 style firearms that meet military specifications. All components are military-spec and made in the U.S.A. Please check restricted shipping zones before ordering. Prompt shipment of my order. Great service and easy site to use. Recently heard about these mags and glad I bought them. Such a great experience. First time ordering from top gun supply. I will for sure use them again. Very helpful customer service. Had the products I was looking for and they arrived within 3 days... during the time frame when Cali could buy magazines this is in heard of... even normally it’s in heard of. Such a great experience. OKAY MAGAzines have been trusted by the US military for 40+ years. I relied on these when I was in the 82nd Airborne Div and you can too! And don't forget to buy from Top Gun Supply for fast and responsive service. Just placed another order for mags from Top Gun Supply. Top Gun Supply always seems to have the mags I need when others don't. This time I ordered the OKAY Industries E2 AR mags. The mag price per each was very competitive, considering Calif just opened up to "normal size" mag sales and many other dealers had already run dry. I will shop from Top Gun Supply again. Great magazine smooth feeding no problems at all.Exceptional delivery ordered Tuesday delivered Friday wlll order again Thanks Brad.